Newly installed Master Phil Davis welcomed five new Freemen to the Company. Master Phil Davis was Installed as Master (for the second time) at Haberdsaher's hall in September 2018. This year is the 25th Anniversary of the annual Children's Magical Taxi Tour which sees over 100 cabs taking sick and terminally ill children on the trip of a lifetime to Disneyland Paris. Our Company is the 104th Livery Company of the City of London, having received Grant of Livery in February 2004. Our members are all professionals who earn their living through the Hackney Carriage trade and include some of London's black cab drivers, renowned for their famous Knowledge of London. The main purpose of the Company is to bring together like-minded people who wish to maintain and secure the long-term interests of those who earn a living within the Hackney Carriage trade. The Company also endeavours to promote public awareness of the extremely high standards of the Hackney Carriage trade and industry. Trade and craft associations have been established all over Europe for many centuries. In the City of London these companies are known as the Livery and all are unique in their survival, number and diversity. 'Guild' derives from the Saxon word for payment, since membership of these fraternities was, and still is, paid for. The word 'livery' refers to uniform clothing as means of identification, hence the term of freemen being 'clothed in livery' when they become liverymen of their Company. The Worshipful Company of Hackney Carriage Drivers is the 104th Company of the City of London, having received Grant of Livery in February 2004 and earned its Royal Charter in October 2013. With our origins dating back to an original Act of Parliament in 1654 we have earned our place as an integral part of the functioning of the historic City of London. Our objectives are to raise public awareness of the high standards of the London Hackney Carriage Trade and Industry and to work to ensure continuous improvement in the health of the industry through managed growth and development, ensuring that the London cab remains attractive to those passengers who live and work in London and preserving the elements of the industry that are considered irreplaceable - such as the famous 'Knowledge of London'. The Worshipful Company of Hackney Carriage Drivers also operates the TRIP (Taxi Driver's Response to Major Incidents Project) initiative, which aims to provide licensed London cab drivers with up to date information following any major incident in the capital. The TRIP initiative sees The WCHCD partner with the Cross Sector Security Communications (CSSC) group as the Sector Lead for the taxi trade, providing up to date and verified information from the emergency services in the event of any major incident that affects the complex travel network in London. 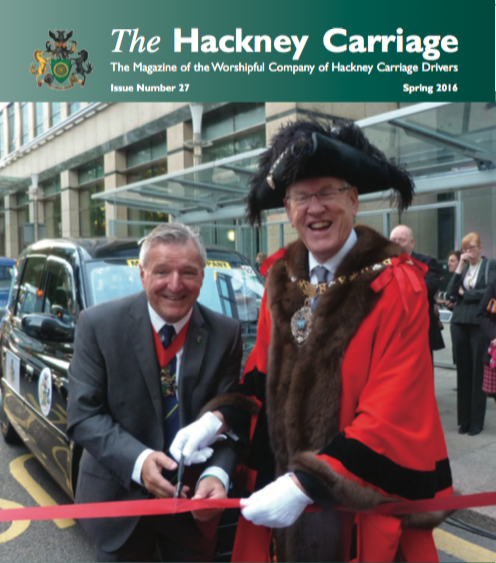 Click Here to see a low-resolution version of our annual Hackney Carriage Magazine. Full colour print versions are available. Private Richard Wise of 20 Transport Squadron - with whom the WCHCD have a long-standing military affiliation. Each year when the Magical Taxi Tour drives down through France a refuelling stop is made at Assevillers Service Station. This award is giving each year to the individual who the Company feels has made a valued contribution over many years.